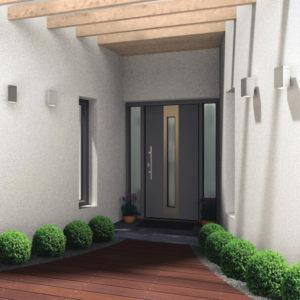 Entrance doors – is a key element of house facade. Front entrance doors – key element of house facade. Every day you see, touch and use it. Front entrance doors must be safe, warm, maintenance free and match the exterior. Even more we can manufacture matching front entrance doors and garage doors. 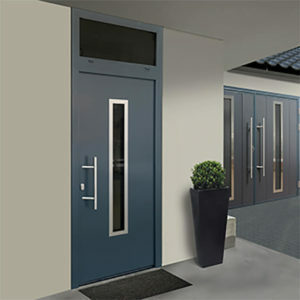 We offer wide range of made to order entrance doors. Also we offer numerous design choices including possibility to create your own design. Latest technologies combined with perfect design results outstanding appearance and performance. Therefore steel entrance door is perfect choice for a reasonable price. As we manufacture all types of garage doors and entrance doors so matching both is no longer a problem. Therefore by installing matching doors you can create staggering curb appeal. Frame is made of composite aluminium profiles with 24 mm thick thermal break. Leaf is 65 mm thick with steel sheet skin. Thermal insulation – freon free PU foam. U-value up to 0.73 W/m2K. Good quality and price ratio. RD65 frame is made of composite aluminium profiles with 24 mm thick thermal break. Leaf is 65 mm thick with double steel skin filled with freon free PU foam. Furthermore three contour sealing ensure perfect insulation. High quality alloy and powder coating, patented ball-bearing system will guarantee durability and performance. Also 3D adjustable feature allow to get perfect sealing after decades of service. Durable aluminium and PVC composite threshold profile. Threshold height is 12 mm on the inside and 22.5 mm on the outside. Made to measure sidelights with triple safety glazing will let more sunlight in to your home. Choose one of available glazing options: clear, matt olr tinted. Sidelights can be on left on right and on top of the entrance door. Also we offer possibility to combine all of these options on one door. Sidelight width limitations are min 400 – max 1000 mm. Top sidelight height limitations are min 400 – max 1000 mm. We offer 5 basic door leaf glazing options. In addition you can modify them by changing layout and quantity of windows. All windows are with triple safety glazing and brushed aluminium frames outside and inside. Min frame width is 40 mm. In addition custom window sizes available. Ryterna offer 3 glazing options for RD65 model. Ryterna offer wide range of locking options. The simplest one is 3 point locking system. And most sophisticated – 5 point locking system with electric gear. In addition you can connect locks with electric gear to finger scanner, key pad or remote handset. Consequently you can get extra convenience and functionality of your door. All locks can be installed wit electric strike. As a result electric strike gives you a possibility to disable temporarily (day time, etc.) self-locking function. Actually it is important for offices and shops for free admittance during working hours. We install ‘Wilka’ key cylinder with 5 keys. You can chose three levels of key cylinder safety. Ryterna offer 2 models of pull and 10 models of lever handles. All pull/lever handle combinations available. 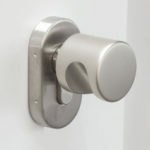 You can choose pull handle from 0.5 up to 0.8 metre long. 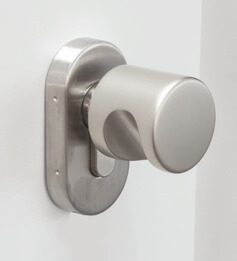 Also as an option we can install lever/lever handles. Please download our brochure to see the variety of standartised designs. Window designs and layouts can be modified. Durable aluminium appliqué will make your door special. All 1 mm thick appliques and window frames are fixed on door leaf surface. Choose one of available or create your own. Small highlight can dramatically change your house curb appeal. Furthermore we can paint door almost any colour. Nothing is easier to match front entrance door with facade or garage door.